If you didn't win last month's James Bond competition, don't despair: Sunspel started a new competition and offers a 20% off on their website , until midnight on Monday October 29. Just type the code ‘BondCompetition’ at checkout and 20% will be removed from your order*. 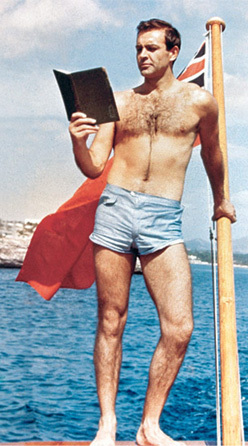 The shorts form part of a then and now element of the exhibition including the swimming shorts worn by Daniel Craig in Casino Royale alongside Sean Connery’s shorts (produced by Sunspel). 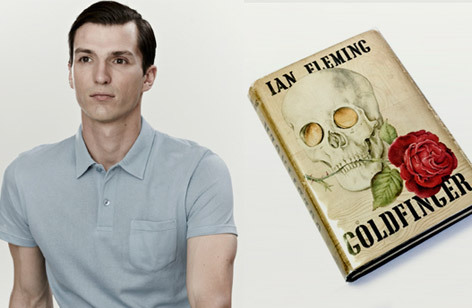 Enter the new Sunspel competition to win a 1959 first edition of Ian Fleming’s ‘Goldfinger’ and your size in the new Sky colourway of our Riviera Polo Shirt. Sunspel’s story with James Bond began in 2006 when Lindy Hemming commissioned the English heritage label to create pieces for Daniel Craig in Casino Royale. Hemming has a long-standing relationship with the brand having worked together on film & theatre since her days with the RSC and National Theatre in London. When working on Casino Royale Hemming once again turned to Sunspel. As Sunspel still own and operate their own factory in Long Eaton in the north of England they were able to design and create a bespoke polo and T shirt for the film. The Daniel Craig block still exists and is used to make the now famous Riviera Polo. *This discount only applies to Sunspel own-brand products, is only valid on Sunspel.com and runs until midnight on Monday 29 October 2012. It is not be be used in conjunction with any other offer or discount.